Digital Science is a leading global technology company serving the needs of scientific research. Digital Science provides software that makes the research process simpler and more efficient so that everyone can work smart and discover more. 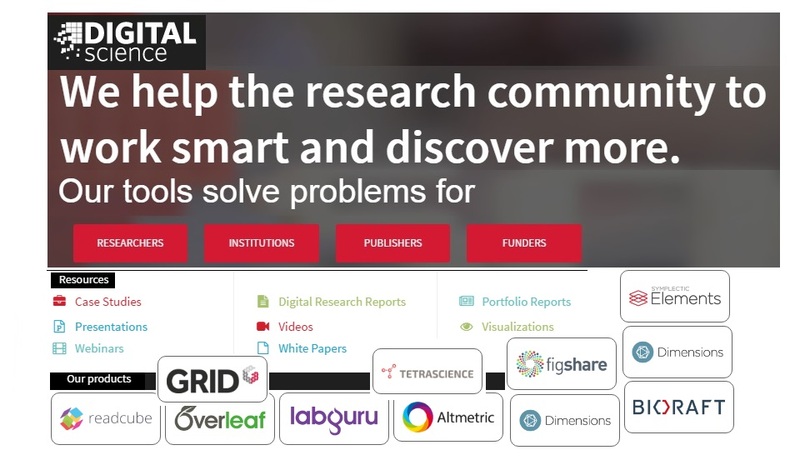 Digital Science helps solve problems for researchers, institutions, publishers and funders. Work more efficiently with smart tools that support you at every stage of your research cycle? Increase the productivity of your institution with smart tools that fuel opportunity, innovation, and discovery? Innovate and empower to make sure your content supports and fully engages with end users and authors? Compare your portfolio against others to get actionable insights to make better decisions? Then Digital Science is for you! Digital Science was founded (in 2010) in England to work with researchers, institutions, publishers, and funders to ensure they can better serve their own communities with technology that delights. Digital Science is operated by global media company, the Holtzbrinck Publishing Group. The Digital Science team believes to be able to change the way science is done by constantly challenging and doing things in a different and more efficient way. By bringing its combined experience together, Digital Science enables its portfolio companies to access an unrivalled array of knowledge, contacts, skills and capital.Digital Science talks to the global research community to understand their needs so Digital Science can help change the way science works from the ground up. The consulting group delivers data-driven analytical reports and technology solutions to research policy and management clients such as higher education institutions, charities and funding agencies, publishers and policy bodies. As a unique investor with a proven record of deep domain expertise and an extensive network in the scientific and research markets, Digital Science incubates and invests in the most promising scientific research software. Digital Science’s software helps to support researchers at every stage of the research cycle to ensure they can work more efficiently and discover more. When it comes to scaling Digital Science’s product and getting it in front of users or clients, Digital Science’s network is unparalleled. A Catalyst Grant (up to £15,000) programme helps get early stage ideas off the ground and bring them to life. If you’ve got an innovative scientific software idea, then Digital Science has got the funding and resources to help it grow. Digital Science’s grants can help take your idea from concept right through to prototype. Submit your application and you’ll be on your way to bringing your idea to life. Digital Science applicants have come to Digital Science from all walks and stages of life and from all across the world. Digital Science is also a big fan of interoperability and continually looks for companies which may fit with Digital Science’s existing portfolio, with the goal of helping the research community to work more efficiently and discover more. Visit Digital Science platform to learn more about its products, services, resources. Digital Science would love to hear from you, so please get in touch using the form at the bottom of this page. Sign up for Digital Science newsletters. The Digital4Science platform allows you to conduct and be part of interactions with scientists, technologists, researchers and innovators. This platform stimulates conversations on Excellence in Science and its activities around the Open Science Cloud, e-infrastructures, High Performance Computing, Future & Emerging Technologies and the FET flagships.